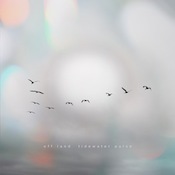 Soft and every bit as fluid as its title suggests, Tidewater Pulse, the new release from Off Land, is classic deep ambient. Structurally simple on the surface, the music here employs minimal movement, field recordings and well-planned depth to be both relaxing and intriguing. Musician Tim Dwyer fully involves the listener in his interpretation of “the water cycle, as well as the expectations and excitement of travel.” This is definitely a headphone listen; Dwyer uses a lot of small sounds, light accents that texture the edges of his warm drifts. It may be a simple crackling sound or something as full as a crowd of voices. They act as well-placed waypoints, attention-getters that do their job with subtlety. The mix works very well across these nine tracks. “Precipitation” is a gorgeous, dreamy piece opening with long-echoing piano and a wispy voice easing out of a misty backdrop. Repetition is key here; the piano phrases–a chord and two descending notes–remain steady in their cadence, allowing things to change around them. “Never Been” is comforting and slow, easing its way to conclusion with a recording of water–and, again to catch your ear, dogs barking in the distance. (At least that’s what it sounds like to me.) There are, obviously, water sounds in Tidewater Pulse, but Dwyer never uses them in an up-front way. They appear, they recede. This is not a “sounds of the ocean” relaxation disc, it’s just a set of work inspired by it. Dwyer also mixes up the feel in places. “Drift Ice” has a keen edge of uncertainty. Scratching and cracking sounds fill the space and another voice sings in a sort of a drowsy, disaffected way. The track comes off colder than the ones around it, but is effective in doing so. A stretch late in the track, with little more than the scratching sounds and long chords with a bit of a pipe-organ tone to them, is beautiful in the way it impacts with minimal elements. “Petrichor” hovers near the nexus of dark and tribal. A steady thrum on frame drum and a ritual-ready clatter of shakers carry the tone. The pace is very slow and deliberate, sound-pieces slotting strictly into their assigned places. “Permafrost” and “Wait” introduce light, more active rhythms into the mix. “Wait” offers a rain-spatter sequencer line traipsing over pads before giving way to them. “Permafrost” pushes along on an insistent thump that underscores swelling textbook-ambient pads and a rich bass drone. Tidewater Pulse is one of those quiet-companion albums, the thing you listen to on loop when a reflective mood strikes. But it’s also a companion you want to know intimately, one you want to understand in each and every sound, and it rewards that intimacy. A great release from Off Land.